Register and start training as soon as today! Or, contact us for details at info@inteqgroup.com or 800.719.4627 to discuss your business analysis training objectives and how Inteq's Business Systems Analysis training can help you in achieving those objectives. Inteq's Agile Business Analysis training course enables analysts to rapidly and intelligently prioritize requirements and optimize resource (time, talent, budget) allocation to get the right requirements "right" - using the right techniques to rapidly deliver the right level of detail and precision, to the right people at the right time. Inteq’s Agile Business Analysis course applies to the spectrum of business analysis projects from Business Process Reengineering (BPR), digital transformation and I.T. modernization – to identifying, analyzing and specifying business system requirements and orchestrating change management. Agile business analysis is essential in today’s increasingly complex, rapidly changing and often chaotic, globally competitive business environment. Projects often span multiple business areas with different, sometimes conflicting, business practices. Getting "buy in" and support from a wide range of sponsors and subject matter experts is critical. Organizations are lean. No one seems to know "the business" - only pieces. Access to knowledgeable subject matter experts is increasingly difficult - often resulting in an endless chain of references to "someone who knows". Business is fast paced. Innovation is essential. Everyone needs a solution “now”! There never seems to be enough time to get it right. However, there is little tolerance for getting it wrong. Delivering increasing levels of customer and business value is essential to competitiveness. Organizations continually evaluate, prioritize and fund projects based on delivering organizational effectiveness and operational efficiency. Inteq’s Agile Business Analysis course leverages the best practice skills, methods and techniques gleaned from projects across the spectrum of industries coherently organized in connection with the Agile Extension to the BABOK® Guide. Agile Business Analysis is the perfect follow-on to inteq’s Business Systems Analysis, Business Processes Modeling, Business Process Management courses. Inteq's business analysis training courses have emerged as the gold standard for professional business analysis training - and are simply the most effective business analysis training courses available in the industry. Inteq's Agile Business Analysis training course is more than education; its transformation - for the participants, project teams and their organizations. That’s why over 300,000 business and systems analysis professionals worldwide choose Inteq's business analysis training courses. 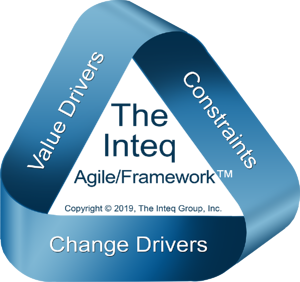 Inteq's Agile Business Analysis is a highly interactive high-energy training program. It’s specifically designed to enable you and your organization to succeed in today's rapidly changing, complex chaotic business environment. The concepts and content of this course are based on years of best practices gleaned from thousands of business analysis interactions across the spectrum of industries and subject matter domains across the commercial and public sectors. It’s your roadmap for developing enterprise-level professional skills. Participants in Inteq's Agile Business Analysis training receive a comprehensive course workbook, supplemental materials, and a personalized Certificate of Completion indicating CEU (continuing education unit) credits awarded. Getting the User Story "Right"
Participants develop a set of user stories to support a complex set of real-world business and system requirements. This case study provides an invaluable template that participants can leverage to jump-start agile analysis in their organization. Inteq's Agile Business Analysis training course is designed for Business Analysts, Business Systems Analysts, Business Subject Matter Experts, Project Managers, IT Professionals and Subject Matter Experts leading or facilitating agile business analysis and anyone participating in agile business analysis in their organization. None. Inteq's Business Systems Analysis training course provides a comprehensive and cohesive approach to systems analysis regardless of background and level of experience. Agile Business Analysis integrates seamlessly with Inteq’sBusiness Systems Analysis, Business Process Modeling and Business Process Management training courses. Onsite Training: Onsite at your locations worldwide or via our live virtual classroom | Contact us for details. The course is designed for two full days of training. However, Anytime eLearning™ participants can learn at their own pace and on their own schedule. Participants to go back and review the material at their own pace and time schedule to reinforce and further internalize the concepts. Anytime eLearning™ participants have 45-days to complete the course and most participants typically complete the training over 1-3 weeks. In addition to the world-class training, participants also receive a comprehensive course workbook - which is yours to keep, supplemental materials, a personalized Certificate of Completion and CEU (continuing education unit) credits. Inteq's business and systems analysis training courses are available via Anytime eLearning™ and private group training onsite at your locations worldwide or via our live virtual classroom. Inteq specializes in business transformation – including strategy execution, business process reengineering, IT Modernization, and business analysis consulting and training for business and I.T. professionals. Inteq is an approved GSA prime contractor and Inteq consulting services and training programs are available to federal government agencies under the GSA MOBIS schedule. © 2019 The Inteq Group, Inc.